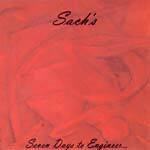 Sach's heralded tape now on CDR! Done in 7 days, this is a glimpse into the life of one dope MC. Total running time is around 20 minutes. Produced and engineered by Sach.